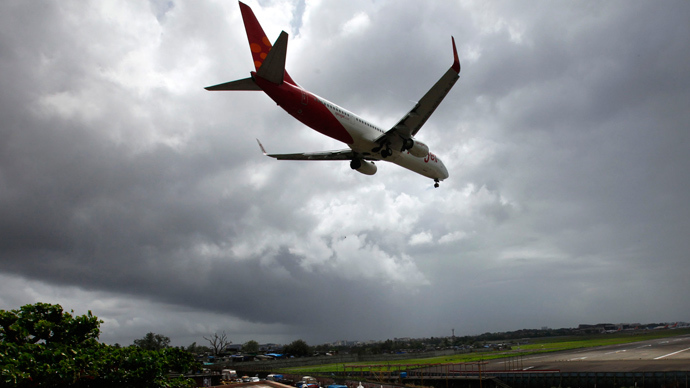 After receiving an anonymous tipoff, Indian intelligence agencies have warned the Bureau of Civil Aviation Security (BCAS) that terrorists may imminently target an Air India flight, and airports throughout the country were put on high alert. The alert has been sounded at major Indian airports, such as Indira Gandhi International Airport in New Delhi and Netaji Subhas Chandra Bose International Airport in Kolkata, according to the Times of India newspaper. The warning that caused a tightening of security came a day after an anonymous telephone call to an Air India city booking office in Kolkata, local police said. “Air India aircraft will be hijacked," a male voice said in Bengali. Kolkata Police's Special Task Force and detective department have joined forces to track down the caller. "We have filed a complaint at Bowbazar police station. Since the threat was a general one, regarding [Air India] flights, we have heightened security on all aircraft operating across the country," an Air India spokesperson said, confirming the call. Afghanistan’s intelligence services are also on alert, having received information on a possible hijack of a plane flying from New Delhi to Kabul, Pajhwok news agency reported. The anonymous call came as US President Barack Obama is set to visit India on Republic Day, January 26. "More security personnel have been deployed in and around the airport. There will be tighter screening of people and anyone who appears suspicious will be detained and questioned. In addition, there are quick reaction teams on standby," a source at Kolkata airport said. The authorities have introduced multi-level checking even of the staff members, so the security checks are expected to take more time now, and there have already been slight delays in flight departures. Cabin crews have reportedly been asked to look out for “problem elements,” and the ground staff have been instructed to thoroughly check all cabin baggage after the boarding of passengers. India’s military will also be patrolling areas close to the New Delhi airport on vehicles, equipped with light machine guns. The intelligence alert reportedly says that this threat could be fulfilled the similar way as in year 1999, when terrorists hijacked IC 814 to Kandahar. BCAS is taking the threat very seriously, as the airport in Kolkata was on alert in November last year, and the Coast Guard intercepted a suspicious vessel from Pakistan on New Year's Eve in the Arabian Sea.